In a first-of-its-kind observation, researchers from the University of New Hampshire Space Science Center have documented a unique event that occurs in clouds before a lightning flash happens. Their observation, called "fast negative breakdown," documents a new possible way for lightning to form and is the opposite of the current scientific view of how air carries electricity in thunderstorms. "This is the first time fast negative breakdown has ever been observed, so it's very exciting," said Ningyu Liu, professor of physics. "Despite over 250 years of research, how lightning begins is still a mystery. The process was totally unexpected and gives us more insight into how lightning starts and spreads." Their finding, published in the journal Nature Communications, is another step toward answering the question of how lightning begins. 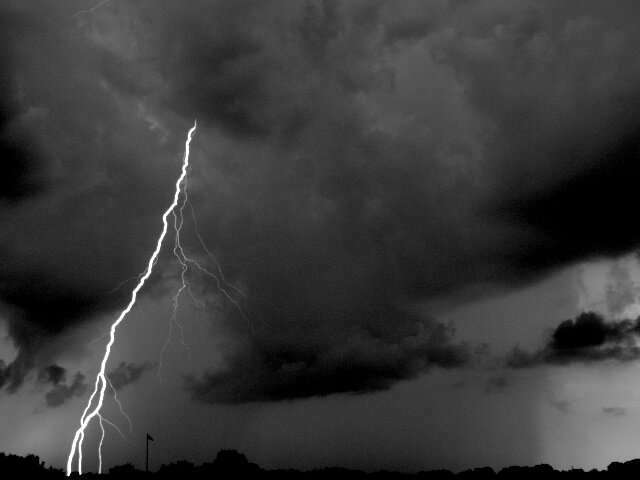 Recently, the problem of lightning initiation seemed to be solved with the discovery of "fast positive breakdown" of air, which matched the theory long held by lightning researchers. Fast positive breakdown involves the downward development of a pathway in the cloud, moving from the positive charge at the top of the cloud to the negative charge in the middle of the cloud. The pathway forms at one-fifth the speed of light and can trigger lightning. However, the newly reported observation of fast negative breakdown shows that an upward pathway—going in the opposite direction and just as fast—can be created in a thundercloud, indicating there's another way to start electricity in the air. Ultimately, this provides scientists with a new view of what's possible inside a storm cloud. 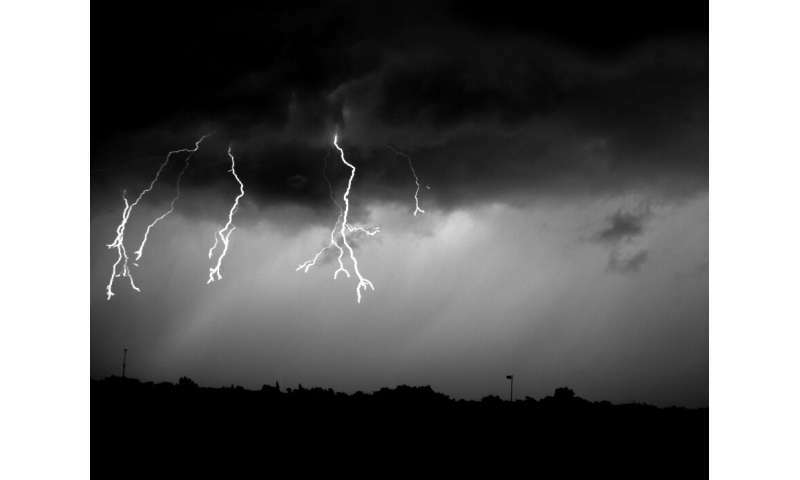 "These findings indicate that lightning creation within a cloud might be more bidirectional than we originally thought," said Julia Tilles, a doctoral candidate in the UNH Space Science Center. 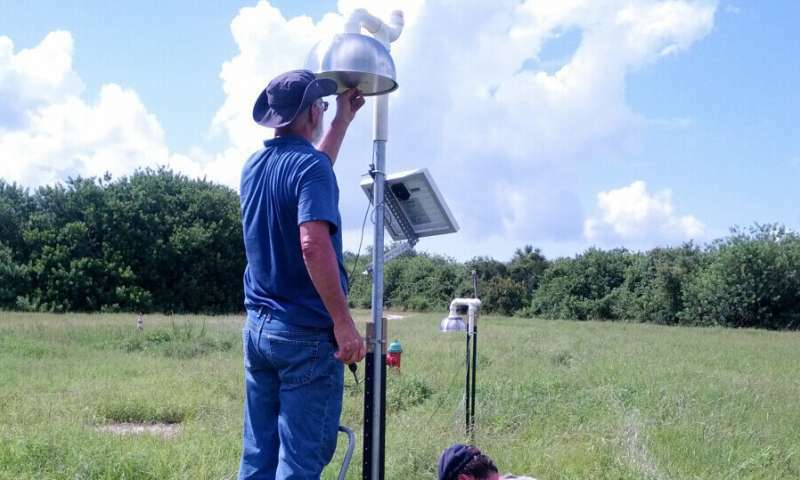 In collaboration with a lightning research team from New Mexico Institute of Mining and Technology, the researchers documented fast negative breakdown in a Florida lightning storm at Kennedy Space Center using radio waves originating deep inside the storm clouds. An array of ground-based antennas picked up the radio waves, which then allowed researchers to create a highly detailed image of the radio sources and identify this unusual phenomenon. Researchers continue to develop images from the data and hope to learn more about how often fast negative breakdown events occur and what fraction of them can initiate an actual lightning flash. How far away was that lightning? Is it possible that a discharge, in the cloud, generates charged (positive) particles, or ionizing radiations, or even partially LASER emissions collimated towards the ground that precisely ionize a discharge path towards the ground? But where do all the excess aqueous electrons e(aq) come from in the first place? Could "Multiphoton Ionization of Liquid Water with 3.0-5.0 eV Photons" provide an answer? What might this mean for the future of solar energy and electrical storage? Their observation, called "fast negative breakdown," documents a new possible way for lightning to form and is the opposite of the current scientific view of how air carries electricity in thunderstorms. Yep, that is about right, the opposite of the current scientific view! LOL. This is very likely true for all naturally occurring plasmas and most definitely cosmic plasmas where the current view is gravity initiates processes in space. Assume the opposite and you are a whole lot closer than the astrophysicists. Nope. You understand the square root of zero about either plasma physics or astrophysics. In which case, why comment? You are clueless. Another pointless post by the resident crankpot troll stalker. Do you ever post anything of value? Yes, umpteen links to real science that shows your lies to be just that. Have you ever posted anything other than BS pseudoscience? Velikovskian loon. Yep, umpteen links to science which like above are the opposite of reality. Now you are back to your habit of lying, given that you have nothing else other than pseudoscience BS. We have been studying these processes for in Earth's atmosphere for 250-years, and we have it backwards using the same upside down physics the astrophysicists use to describe space plasmas. But somehow, according to jonesdumb it is correct in space. Christ you are an idiot. Lightning is rather dangerous and difficult to study. Having metallic instruments around lightning is not particularly advisable. And the only person claiming that plasma astrophysics is wrong are idiotic, unqualified cultist loons such as yourself, who have no idea about the subject. But somehow, according to jonesdumb it is correct in space. Idiot. No lightning in space. LOL! Moron claims no plasma discharges occur in plasmas! Right up there in the top ten stupid comments made. Plasma is very conductive. To produce lightning you need a dielectric to break down. ROTFLMFAO! jonesdumb doubles down on stupid claiming arc discharges don't occur in plasmas! He still hasn't convinced me he doesn't require assistance to put on his pants and tie his shoes, although there is Velcro to explain the shoe part. Show me a lightning bolt in space, idiot. To this vacuous question of jonesy "Show me a lightning bolt in space, idiot." The right honourable cantdrive esquire, does electric discharge occur in plasmas in this vacuum!